When we look at the meaning communicated through our global culture we see a lot of confusion, ignorance, and much in the way of self-made destruction. Using our behaviors as the measure to gauge or understanding of ourselves, it is clear that we either don’t have a firm grasp of the recipe for satisfaction or we don’t care enough to turn our understanding into corresponding behaviors. Depending on where we focus, it is hot spots of either, or and both. We collectively act in ways that destroy the very harmonies on which we depend on both individual and broader social scales. To allow the simmering cauldron of destructive steering mechanisms to contribute to what we experience as life is to participate in and perpetuate our own demolition. There is no suggestion here that the issues we face to effectively address this are simple to understand. Neither is it being suggested that a clear map is equivalent to going on the journey a clear map outlines. While it is arguably true that a portion of our woes are beyond our capacity to address, it is also true that the portion that is certainly within our capacity to address is often left untouched in a frenzy of misdirection and ignorance. Our behavioral disharmony with what nourishes us includes relationships both within and between species. It extends to behaviors that limit or destroy the environmental conditions that are necessary to sustainably support biological life to the fullest. Because we lack a clear vision of truth about ourselves and/or the values that translate vision into action, we behave in ways that directly and indirectly undermine the realization of our full potential. In economics there is a term called “The tragedy of the commons”. It is used to describe the condition when shared resources are depleted by individuals acting in self-interest that ultimately destroys the common resource the community depends on. Aesop’s Fable “Killing the Goose That Laid the Golden Eggs” is another illustration of the tragedy of the commons. Sometimes our poverty inducing feeding frenzy is fueled by ignorance, myopia, or willful acts, but the result is invariably an increase of poverty. Often that poverty comes suddenly and ferociously. With myopia the fuel that generated the poverty we also use our shallow vision to assess the tragic outcome and confuse the symptoms with the cause until the cycle repeats again. This is the reason our history is a collection of nations that collapse over time and we reemerge not because we have changed anything, but because we have tragically diminished our population enough to mask the problem once again. This same tragic theme is repeated on individual scales. The point here is that real wealth is predicated on two key elements: First; cooperative relationships, not predatory and parasitic ones, build wealth. To cultivate a world that grows satisfaction we need to have a stake in each other’s success and wellbeing. Second; enough is enough. Too much or too little of anything is still out of balance. To fool ourselves into thinking that more or less is better is a lie. Extreme denial of self and self-aggrandizement are just two forms of the same out of balance condition. Without a serious probing of the truth about our real nature we cannot navigate toward our fullest potential. In the absence of truth – we sleepwalk from the womb to the tomb – ill equipped to make effective intentional choices that can affect positive and lasting changes. Without truth we’re locked in an impoverished state of being. 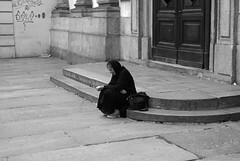 In poverty, we are vulnerable to reducing our experience of life to one that is punctuated with excess followed by agony – diminished or absent of meaning – a passive reflection of the nature of our conflicted environment – we become sticks floating on the currents of ignorance, passively reflecting the cultural heat and cold of our ignorance until we are whittled back to dust. Without a serious exploration of truth we cannot establish the foundation for real choice. Without truth we are locked in a destructive script from which we cannot emerge -spectators in, rather than thoughtful and capable authors of, our experience. Without truth we are destined to be slaves to, rather than shapers of, our experience. Understanding the truth about ourselves is the first step toward moving from chaos to harmony; from a state where dissatisfaction is present to a more satisfied state of being. Developing the discipline to take minute by minute day by day steps toward the direction that understanding reveals characterizes every step thereafter. This is not an easy task, but it is a necessary one because the most secure and impenetrable prisons are not built with metal and stone, they are built with ignorance and lies and powered by misdirected effort. As a culture we tend to focus on visible expressions of violence, especially if they’re close geographically or close in terms of being relatable to our personal lives. We think out loud how terrible it is, perhaps grieve for the affected people and wonder how an individual or group could be so twisted that they spatter our world with such destruction. Wars, terrorist activities and shootings are noticed while the root causes from which these acts grow often go unnoticed. According to “The Hunger Project” malnutrition contributes to more than a third of child deaths every year. If we’re honest with ourselves the fact that 2.6 million deaths per year happen isn’t because we don’t have enough food. It isn’t because we lack the means to distribute the food. It’s because our energies are pointed elsewhere. Our inaction toward real needs is the reason underneath the destructive outcome. In this respect, inaction is the vehicle of violence. When needs are not met, destruction results. Of course hunger is not the only cause of wounds, destruction and the poverty of unrealized potential. When we fail to recognize that investing in each of us to the develop a full range of contributory talent,s we rob ourselves of both our current and our future. As humans, we have physical needs as well as an array of social needs. When these needs are unmet the result is destruction which takes many forms. Destruction resulting from social hunger can take the form of ill health and death or other forms such as social violence. If we don’t recognize that failing to meet our nutritional needs in all areas, including social, we will never truly address the real issue. We will simply rearrange our focus from one symptom to the next as the cause continues to elude us. Arun Gandhi who spent his life on concepts of nonviolence said two things that apply here to understanding the contribution of inaction toward violence. He said; “We often don’t acknowledge our violence because we are ignorant about it” and “it is passive violence that fuels the fire of physical violence”. We can look at a relatively mild example of violence such as graffiti to examine how this process works. Youth starving for significance and constructive social connections will express themselves with wall art that could be considered a violation of the public or private property of others. Alienation, a lack of purpose and the expressions of the lack of the worth of human life gets telegraphed as a clear message by what we pay attention to, and also by what we do not pay attention to. Taking it further, predatory gangs and the violence associated with it stems from not having a constructive means of expressing and experiencing communal belonging. In other words; violence in communities is often the outward symptom of an unmet social hunger. It should come as no surprise that starvation compels creatures act in some way to satisfy that hunger, in extreme cases desperate acts can become the norm. If there is no means to satisfy the hunger constructively, or if the pathway to satisfy it is not understood, violent behaviors result. Whether that expression is a body in the process of violently consuming itself, or maladaptive social expressions, the core is still destruction born of unmet hunger. If we are not attentive to satisfying our real needs we will continue to see expressions of destructive behaviors. While some issues can fall outside our capacity to control and the illustrations here represent only part of a larger picture, there is certainly room for improvement if we recognize that the seeds of violence grow in the soil of apathy. 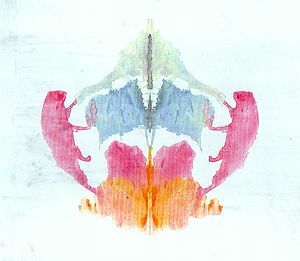 The eighth blot of the Rorschach inkblot test. Knowing the rules of a game is necessary in order to achieve the possibilities that emerge as a function of the rules. At the same time rules create limitations through boundaries, they also enable the possibility of much greater achievement. With a common language or at least a translation bridge built on specific rules, the value of meaning and purpose can emerge where it otherwise wouldn’t exist. When we begin to explore the sources from which we acquire the rules for what could be called “the game of life”, we see that much of it is not clearly defined or well organized. A few things are fairly apparent; “Look before navigating traffic”, “Be prepared for the weather”, but the vast majority of life rules is a mushy hodgepodge of murky ill-defined soup. Indirect communication is the mainstay of the ink that spatters on our map of life. No one ever sits us down and explains the vast majority of things we learn to hold as true and use as a rudder to steer our experience of life. The rules leak into our state of awareness from between the lines, underneath the text and from the margins. This inky spatter can look like a Rorschach inkblot test onto which we can project any number of things. We sometimes learn to conjure demons that aren’t real and do battle with them drawing our peers into our imaginary fray. We can paint villainy and virtue on our social landscape without respect to fact, built only on the word salad we learned to concoct without a firm understanding of the destructive outcomes which we blindly drive. Unstated life Rules #416: I was brought up in an environment with an unpleasable tyrant. I learned without words to believe that it was my job to please the unpleasable tyrant. I got the message that they mattered, and I did not. I would attempt to do this by tiptoeing around their violent moods, or running around frantically when they barked a command or if I thought they wanted something. They behaved as if their satisfaction was the centerpiece of my life and I wholeheartedly believed that rule at the same time I felt rejected and hopeless. I lived with frequent bouts of stress, disappointment and self-loathing because I thought I failed and I was a failure. As a grown person I blindly looked for those same kinds of relationships. When I found someone who was like that or who I could mold into a tyrant I proceeded to bleed myself in a futile attempt to make their insatiable lives happy. Again and again I failed, because that is who I was – a failure. Unstated life Rule #417: To protect my destructive tendencies I confuse painful but accurate observations that would improve my life with hurtful insults. Because of this, I don’t face facts that would help me lead a more fulfilling life so I continue damaging myself and others and buff my shiny armor with a gritty polish made of self-righteousness and imagined offense. Unstated life Rule #418: My behaviors undermine the very things that nourish my life. I am well aware disease can take over a body and destroy it to serve the disease, but it doesn’t occur to me that this is exactly what is happening to my life and that I actively perpetuate the destructive course. Because I don’t see this, it doesn’t occur to me to reach out for help. Should any help happen to come into my life, I am repulsed by it. In addition to being infected, I am contagious. I transmit the same disease I carry to others who are vulnerable. I falsely think my problems are because the world doesn’t behave the way I think it should. I portray myself as a victim and rather than take responsibility for my own role in shaping life, I diminish and destroy myself and others because of my infection. Rather than bring balance, I swing the pendulum from one extreme to the other. 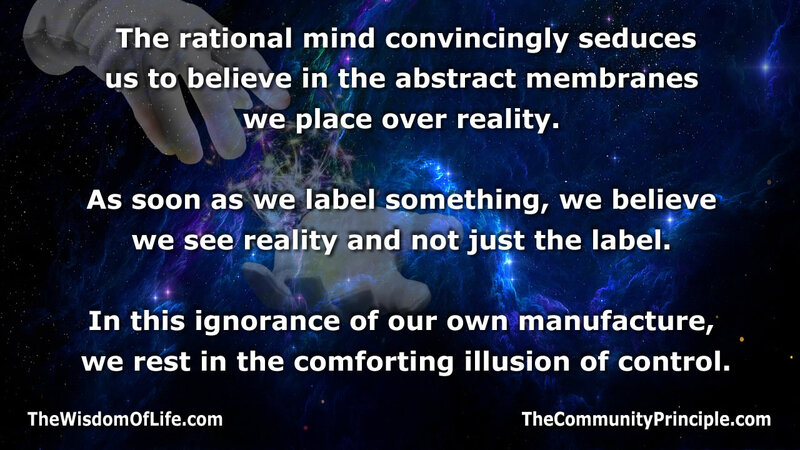 The point here is that the belief systems we pick up are often very subtle. It is important to realize that we are not human “knowings” – we are human “beings”. So much of who we are is shaped by being in the moments we have been and those in which we are, not by whether or not we have the capacity to understand the depths of that being, nor its power to shape what we experience. The truth can set us free, but it does not render itself to the casual observer. Self-discovery is a product of committed and sustained action. The truth that emerges is not a flattering companion that respects our feelings. It simply is what it is – an unvarnished look at what we do and what that doing means – and that can be the hardest truth of all to face. It is also the only way we can understand that a fulfilled life demands balance. Too much water drowns us, too little dehydrates us. The end result is the same – destruction. The center of the target is the goal. To miss the mark in any other direction merely brings more imbalance which is the very nature of dis-ease. And balance is the real rule of the game of life. In April of 1953 a scientific paper was published by James Watson and Francis Crick that outlined the structure of DNA. For the next half century a DNA centered view was the cornerstone of our scientific understanding of biology. 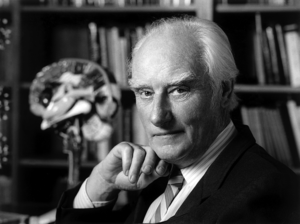 In 1958, Crick established what was known as the “central dogma of molecular biology”. The basic idea was that DNA is the source of biological information – that it could be copied, made into other things like messenger RNA (mRNA) and proteins, but information from proteins and mRNA couldn’t influence DNA. As it turns out, this is not as strict a rule as we once thought. We have come to find out that things outside DNA can influence which segments of DNA are produced. This has a number of important implications to understanding ourselves. DNA is much like a library of songs which can get “played” based on communication from outside sources. In other words; what happens to you is very important in determining what DNA songs get played. External influences have been shown to travel through a lifetime and multiple generations. An example of this external influence can be seen in research which shows that children subjected to trauma early on in their development are at a higher risk of such things as anxiety and mood disorders throughout life. Traumatic experiences can induce lasting changes to our gene expression and therefore our experience of life in general. If we take this fact a bit further we begin to see that much of what we perceive and experience on a day to day basis is influenced by the distant past. When we look closer at this aspect of our biology it makes self-destructive behaviors and high octane personalities more understandable. Conversely it makes the origins of laid back personalities more understandable as well. It also explains why we sometimes react in ways that are disproportionate to what is actually going on in reality even though we know better. Our rational lens is sometimes out of alignment with what we are geared to express through our biology. Our biology may be structured to produce the chemicals we experience out of emotion in ways that cripple our capacity for function in fulfilling and satisfying ways. Another important aspect of these widely scattered experiential factors that shape what we know as personality and identity is that who we are is powerfully influenced by experiences over which we have made no choice. As we develop a greater understanding of the factors that go into shaping who we are it becomes increasingly clearer that destructive behaviors are more accurately viewed through a lens of the effects of experiential wounds and starvation rather than free will choices of crimes deserving of punishment. Our traditional models of choice, free agency and personal accountability may not be something we must abandon, but they are something that belongs in the context of the factors that really do contribute to shaping our behavior. Physics plays a central role in who we are. While this has a down side it also tells us that intentionally shaping nourishing experiences for each other has lasting effects. A starving lemur makes her way slowly through the grasses in a sun dried corner of Madagascar. Dry seasons are normal, but this year is particularly harsh. Her troop is moving both wearily and warily forward with the dual goal of finding food and avoiding predators. Her infant struggles to cling to her belly as they make their way through the bone dry twigs and barren patches of scorched earth. She has no more milk to offer. Her body has used up its fat reserves and is now devouring muscle. She is dehydrated. The troop is tired, but it can’t afford to stop or let its guard down because the predators are ready to seize the opportunity. For them it’s a time of plenty. The infant has no more strength and drops softly to the ground. Its mother, with little strength of her own left, is now faced with the torturous conflict between staying with her baby and moving on with the troop. She knows she can’t do both. She doesn’t have the strength to carry her child, and to stay means death for both of them. Her hunger, her need for the safety of the troop and her mothering instinct are waging war with each other inside of her. She calls out to her troop to try to draw back the safety of numbers, but they soldier on. She indecisively circles toward the troop and back again to her child. As the minutes pass and she grows more conflicted over this terrible choice. Reluctantly, she moves deliberately in the direction of her troop. 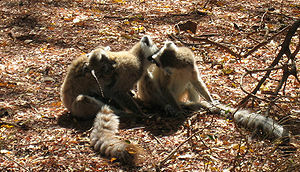 The baby lemur cries out with its remaining breaths, she looks back as she is leaving. The choice, painful as it is, and as certain as it must be, is to leave her child behind. This drama and many more like it play out every day without a word. Lemurs can’t read, write or talk – yet without the means to wrap her situation in anything we might call a verbal veneer, this lemur is no less aware and feels no less turmoil than what might take place in a human drama. The fact that a creature cannot apply a verbal paint to their situation doesn’t diminish the essence of experience. Our ability to verbalize our state of being to some degree – is a far smaller a portion of ourselves than we commonly give it credit for. If we probe the entire landscape of the living further and deeper than our own thoughts and skins allow, we can begin to glimpse the dominance of non-verbal awareness as the overwhelming portion of what we all know, and experience as life. A crocodile stalking its prey, a mayfly looking for a mate… are clear evidence that the non-verbal portions of identity expressed through all biological organisms is the most powerful driver of experience. Awareness, the vast majority of which is wordless, cascades throughout all living things – and an inability to frame experience in abstract symbols does not diminish the experience itself. They are no less aware merely because they lack this thin blanket of words we wrap ourselves in. Even less than the thinnest of coatings on our lives, our verbal state of awareness is often an irrelevant distraction, a deceiver and a sideshow to what is really going on with our own unspoken identity. Many of us are driven by powerful emotional undercurrents spoken in an entirely different language that communicates through behaviors and is unattached to our verbal state of being. We can live our whole lives deluded in our thoughts as we are actually living out unstated life goals that remain hidden from our verbal lens. These emotional drivers can direct our lives and our words can be diminished to feeble tools to scratch at such things as artificial comfort and false understanding on what really lies beyond our capacity to understand in a verbal sense. Without clear vision we cannot move with intention, neither can we understand the forces that drive our experience. Facing reality by verbal means is of great value. It is also necessary to steer our experience effectively, but it takes an accurate lens that is built on the bravery to face things as they are, and not as we want them to be. It also takes the discipline to work within the framework of “what is” do actually affect what “can be”. A step in the direction of leading an intentional life is recognizing that our identity is much more than what we are able to capture with our symbols. In fact, symbolic languages can have a pretty drastic downside if they are not calibrated by a firm awareness of what is truly going on. They can be easily conflated with any number of superficial artifacts that hide the whole picture and render us a blind navigator and a spectator in our own lives. Words can generate their own false image and lead us to falter in our capacity to live intentionally. The most important goal we can set is to become aware of the ones we’re already working toward as we’re looking the other way… lost in our own little words.